Analyses, synopses, illustrations, and other essential Saltes. 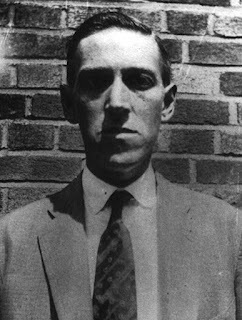 This blog project describes each of H. P. Lovecraft's stories (listed at right alphabetically/ chronologically) by offering opening and closing story fragments (Opening Statement, The Horrible Conclusion), detailed synopses and story "mythos" notes. For each story I also picked out some passages (Essential Saltes) which struck me as being either particularly Mythos-important, or were simply striking examples of Lovecraft's inimitable ability to convey "man's greatest fear" (these excerpts essentially amount to a collection of "quotable Lovecraft"). Obviously this kind of content will eventually lead to spoilers, so I might not recommend this to be the first Lovecraft site to explore if one wanted to read the stories cold. However, after the initial impact of a story has been experienced, it's very rewarding to step back from the bleeding chunks of Lovecraft's dense prose to get a larger perspective on his work through synopses, highlighted excerpts and Mythos notes. If one is reading these stories in chronological (composition) order, it's also easier to appreciate Lovecraft's evolution as a writer and horror visionary. Each story entry also tries to tie together some of the overall mythology of Lovecraft's world (which, by the way, I consider to be ONE grand mythology, but with two major narratives). 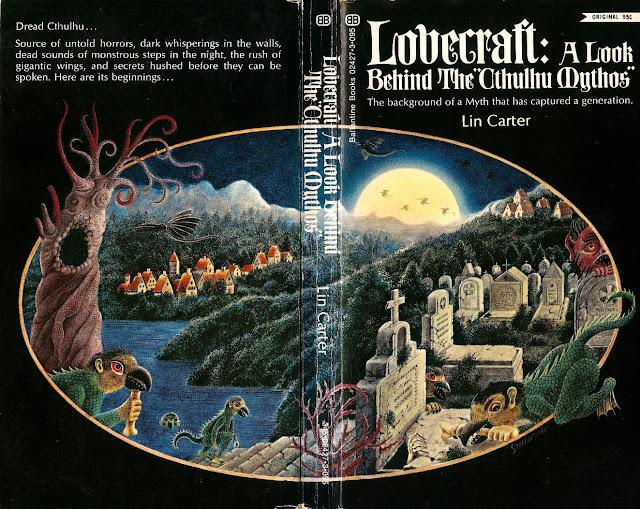 In fact, one of the initial goals of this project was to clearly outline the contours of Lovecraft's fictional mythos, drawing directly from his own texts (and not extrapolating from the work of his peers, fans or latter-day role-playing game book designers). However, I learned fairly early on in my research that the Lovecraft "mythos" was never designed with meticulous, Tolkien-like "world-building" intentions. HPL's cast of subterranean/aquatic/cosmic forces slowly evolved over decades, and his "other gods" would sometimes take on somewhat different appearances and characterizations from story to story, depending on whatever was needed, narrative-wise. His world was also often "cross-fertilized" with the fantasy inventions of his writer friends (among them, Clark Ashton Smith, Robert E. Howard, Frank Belknap Long, August Derleth, Robert Bloch, etc..). Oftentimes, HPL would use the titles of their shared "ephemera" as colorful garnish to create a sense of verisimilitude in his tales (Howard's Valusian serpent-men, Ashton Smith's Tsathoggua, Bloch's "De Vermis Mysteriis”, Searight's "Eltdown Shards", etc...). In the end, it's clear that HPL was not overly-concerned with the zoology behind his cosmic menagerie, and so the idea of putting together a "bullet-proof" mythos seemed less practical to me. 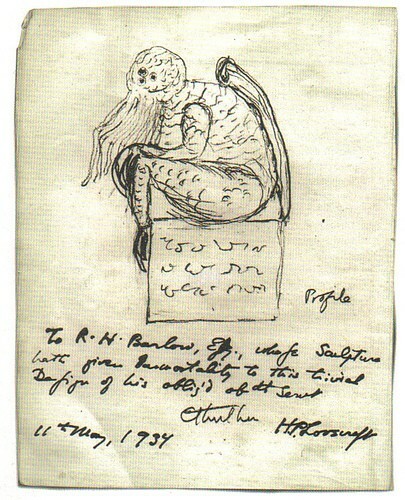 However, by reading and summarizing each of HPL's stories in order of conception, I was able to appreciate how he created a "pseudo-mythos", tomb-by-tomb, degenerate-cousin-by degenerate-cousin, statuette-by-statuette, tentacle-by-tentacle, formless-Shoggoth-by formless-Shoggoth... And if one wanted to experience HPL's body of work as "documentary evidence", one could say that whenever a new aspect of the mythos contradicted a previous characterization, the previous description was due to a miscommunication or lack of understanding on the part of the narrator. Ultimately this led to a pretty satisfying reading experience for me. 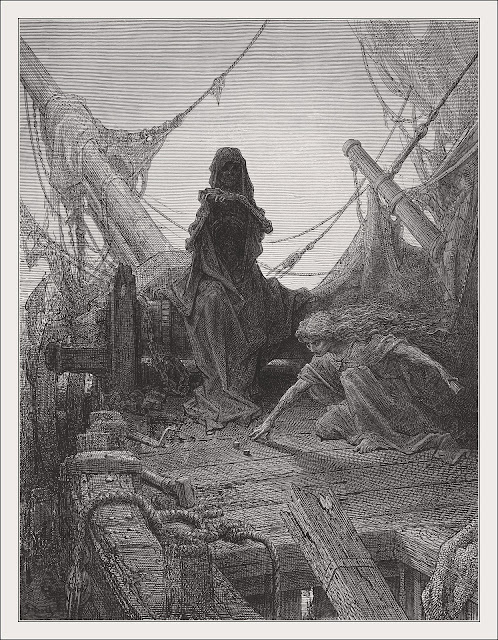 Gustave Doré's "Rime of the Ancient Mariner" (1798) was a major inspiration to the young Lovecraft. Feel free to visit your favorite Lovecraft tales, or start from the beginning. I started my coverage with 1905's "The Beast in the Cave" and one can navigate this entire site in one book-like thread by clicking the "Follow'd by..." link at the bottom of each chapter. "…but God! I dare not tell you what I saw!"